Handwritten Harland & Wolff records relating to the Titanic and a copy of the Ulster Covenant will go under the hammer at Bloomfield Auctions later this month. The Harland &Wolff minute book and an original copy of the Ulster Covenant are just two of the most fascinating lots at the Militaria & Memories Auction in Belfast on Tuesday, June 20. The old shipyard ‘Minute Book B', dated 1905-1918, and with an estimated value at auction of £400-£600, chronicles the day-to-day business of shipbuilding in Belfast. 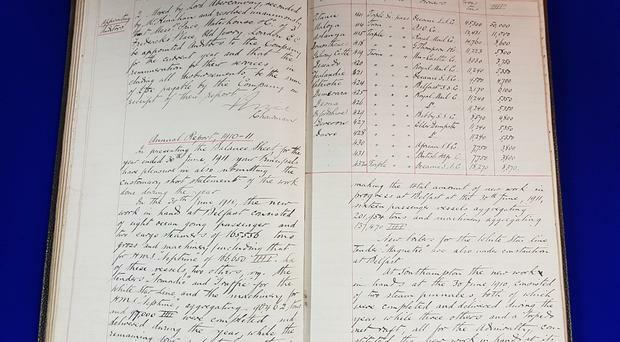 Within its pages, the Balance Sheet prepared for the 1910/11 Annual Report proudly shows the celebrated 45,000 tonnes RMS Titanic as a work in progress. "Those who so carefully recorded those details in their elegant Edwardian copperplate writing can have had no idea of the sad fate that awaited the ship once hailed as the largest and most opulent in the world," auctioneer Karl Bennett said. An original Ulster Covenant bearing the signatures of Edward Carson, James Craig, Admiral Charles Beresford & Lord Londonderry and others will also come under the hammer, with bids of £200-£400 expected. The original copy of the Ulster Covenant, with its many illustrious signatures, which will be auctioned in Belfast on June 20. Looking forward to the sale on Tuesday 20 June, Mr Bennett commented: “There is always a huge interest in any Titanic-related artefacts and memorabilia so we are thrilled to be showcasing this unique handwritten and craftsman-bound document. Please log in or register with belfasttelegraph.co.uk for free access to this article. "The fact that each entry is handwritten helps to transport today’s reader back into a different age … and I think that same magic is at play when you can pick up and examine a copy of the Ulster Covenant which carries the actual signatures of some of the best known political figures of their day." Mr Bennett has noticed that more and more people are becoming collectors, both amateur and professional. “Whether you are in a position to invest in something of museum-stature significance or you are simply buying an item which brings back memories of your childhood, the fascination of collecting lies in making connections with the past. "People are fascinated with items that give them an insight into history and we’re currently seeing a massive growth of collecting not only antiques, but also vintage items and memorabilia. Amongst the lots likely to attract most interest are a Nymphenburg, Deutsche Reichsbahn porcelain teapot originally used in Hermann Goering’s dining wagon of the Sonderzug (special train). The piece comes from a private collection mentioned in the James A Yannes book 'The Special Trains Of Hitler, Goering Et Al’ and has an estimated value at auction of £2,500-£3,500. The porcelain teapot used on Hermann Goering’s personal train. The Militaria & Memories Auction will be held at Bloomfield Auctions at the historic Owen O’Cork Mill complex on Belfast’s Beersbridge Road on Tuesday, |June 20, with bidding starting at 6.30pm. For information on viewing times, follow Bloomfield Auctions on Facebook or visit BloomfieldAuctions. 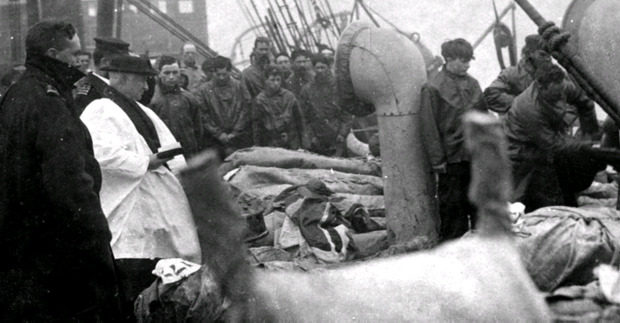 The photograph shows bodies in sacks piled three high on the deck of the CS Mackay Bennett, before being tipped overboard as the ship's priest conducts a service. Photo issued by Henry Aldridge and Son. Survivors of the Titanic disaster in a crowded lifeboat. Survivors of the Titanic disaster are greeted by their relatives upon their safe return to Southampton. Florette Guggenheim (nee Seligman 1870 - 1937, right) and her brother James de Witt Seligman at the offices of the White Star shipping line in New York, April 1912. The pair are waiting to enquire about the welfare of Guggenheim's husband, American businessman Benjamin Guggenheim, who was a passenger on board the Titanic when she sank on 15th April. Benjamin Guggenheim was not among the surviviors. Index cards from The Associated Press Corporate Archive in New York listing stories written by the wire service about the Titanic. A diver accompanies a 17-ton portion of the hull of the Titanic as it is lifted to the surface in the Atlantic Ocean. Front page of The Owensboro Daily Messenger headlining news that the Titanic had sunk. In this 1912 photo made available by the Library of Congress, Harold Bride, surviving wireless operator of the Titanic, with feet bandaged, is carried up the ramp of a ship. Crowds gather around the bulletin board of the New York American newspaper in New York, where the names of people rescued from the sinking Titanic are displayed. The employment record for Captain John Edward Smith. Karl Behr and Richard Williams, who were world-class tennis players who survived the sinking of the Titanic and and went on to win numerous major tennischampionships on both sides of the Atlantic. Merchant Navy Seamen Charles Rice, who was a Fireman on the Titanic and survived. This composite image, released by RMS Titanic Inc., and made from sonar and more than 100,000 photos taken in 2010 from by unmanned, underwater robots, shows a small portion of a comprehensive map of the 3-by-5-mile debris field surrounding the stern of the Titanic on the bottom of the North Atlantic Ocean. Titanic, built by Harland and Wolff, was driven by two gigantic wing propellers measuring over 23 feet in diameter and a center propeller spanning more than 16 feet. The detailed drawing of the RMS Titanic used at Lord Mersey's inquiry into the 1912 disaster. The wedding ring and locket property of Carl Asplund and the wedding ring of Selma Asplund are seen at Henry Aldridge and Son auctioneers in Devizes, Wiltshire, England Thursday, April 3, 2008. The locket and one of the rings were recovered from the body of Carl Asplund who drowned on the Titanic, they are all part of the Lillian Asplund collection of Titanic related items. A heavily water stained leather bound journal bearing notes figures relating to the Asplund family, the property of Carl Asplund, is seen at Henry Aldridge and Son auctioneers in Devizes, Wiltshire, England Thursday, April 3, 2008. The locket and one of the rings were recovered from the body of Carl Asplund who drowned on the Titanic, they are all part of the Lillian Asplund collection of Titanic related items. A unique emigrant inland forwarding order to the White Star office in New York, is seen at Henry Aldridge and Son auctioneers in Devizes, Wiltshire, England Thursday, April 3, 2008. The locket and one of the rings were recovered from the body of Carl Asplund who drowned on the Titanic, they are all part of the Lillian Asplund collection of Titanic related items. Photographs of (from left) Felix Asplund, Selma and Carl Asplund and Lillian Asplund, are seen at Henry Aldridge and Son auctioneers in Devizes, Wiltshire, England Thursday, April 3, 2008. The locket and one of the rings were recovered from the body of Carl Asplund who drowned on the Titanic, they are all part of the Lillian Asplund collection of Titanic related items. A gold plated Waltham American pocket watch, the property of Carl Asplund, is seen in front of a modern water colour painting of the Titanic by CJ Ashford at Henry Aldridge and Son auctioneers in Devizes, Wiltshire, England Thursday, April 3, 2008. The locket and one of the rings were recovered from the body of Carl Asplund who drowned on the Titanic, they are all part of the Lillian Asplund collection of Titanic related items. An emigration contract/ticket, purchased by the Asplund family for passage from Southampton to New York, and used on the Titanic, is seen at the Henry Aldridge and Son auctioneers in Devizes, Wiltshire, England Thursday, April 3, 2008. The locket and one of the rings were recovered from the body of Carl Asplund who drowned on the Titanic, they are all part of the Lillian Asplund collection of Titanic related items. This photo provided by Christie's auction house shows a life preserver from the ill-fated R.M.S. Titanic found during the initial search for survivors and owned by the same family for 90 years. Going on the auction block in June, it is the first Titanic life jacket to be offered at auction in the United States, and is one of about six believed to have survived to this day, Christie's said Thursday, May 29, 2008. Roberta Maioni, a survivor of the Titanic disaster. The White Star Line badge that was given to Roberta Maioni, a survivor of the Titanic disaster, by a man she was said to have fallen in love with during the boat's maiden voyage. Sheet music for "Put Your Arms Around Me, Honey" from the Broadway production "Madame Sherry," (1910) is shown as part of the artifacts collection at a warehouse in Atlanta, Friday, Aug 15, 2008. The 5,500-piece collection contains almost everything recovered from the wreckage of the RMS Titanic, which has sat 2.5 miles below the surface of the Atlantic ocean since the boat sank on April 15, 1912. Third-class tea cup china used by passengers and the crew, is shown as part of the artifacts collection at a warehouse in Atlanta, Friday, Aug 15, 2008. The 5,500-piece collection contains almost everything recovered from the wreckage of the RMS Titanic, which has sat 2.5 miles below the surface of the Atlantic ocean since the boat sank on April 15, 1912. Currency, part of the artifacts collection of the Titanic, is shown as part of the artifacts collection at a warehouse in Atlanta, Friday, Aug 15, 2008. The 5,500-piece collection contains almost everything recovered from the wreckage of the RMS Titanic, which has sat 2.5 miles below the surface of the Atlantic ocean since the boat sank on April 15, 1912. The work shirt of W. Allen, a 3rd class passenger on the Titanic, is shown as part of the artifacts collection at a warehouse in Atlanta, Friday, Aug 15, 2008. The 5,500-piece collection contains almost everything recovered from the wreckage of the RMS Titanic, which has sat 2.5 miles below the surface of the Atlantic ocean since the boat sank on April 15, 1912. A seven of clubs card is shown as part of the artifacts collection at a warehouse in Atlanta, Friday, Aug 15, 2008. The 5,500-piece collection contains almost everything recovered from the wreckage of the RMS Titanic, which has sat 2.5 miles below the surface of the Atlantic ocean since the boat sank on April 15, 1912. A compensation letter sent to Millvina Dean's mother from the Titanic Relief Fund. One of the three Titanic propellers -- the stern section landed upside-down.Photographed by Leonard Evans on 2 September 2000 from submersible MIR 1 -- 2.38 miles below surface of Atlantic Ocean. Bow of Titanic - Photographed by Leonard Evans on 2 September 2000 from submersible Mir-1 -- 2.35 miles below surface of Atlantic Ocean. Titanic stoker William McQuillan was feared lost at sea, but his grave was subsequently discovered in Canada after 93 years... the last resting place of an Ulster-born Titanic victim. An 18-carat gold pocket watch which is among the rare artefacts connected to the Titanic to be sold by Bonhams and Butterfields in Massachusetts in the US on May 1. The watch, which was damaged when disaster struck mid-Atlantic, belonged to Nora Keane, an Irish immigrant, living in Harrisburg, Pennsylvania with her brothers and sisters. A pair of glasses is displayed in the Titanic: Aritifact Exhibition at the Metreon on June 6, 2006 in San Francisco, California. Binoculars are displayed in the Titanic: Aritifact Exhibition at the Metreon on June 6, 2006 in San Francisco, California. One of the images on display at the Titanic - Built in Belfast exhibition in Union Station, Washington DC. A deckchair removed from the Titanic just moments before it set sail from Cork. Lillian Asplund, the last US survivor from the sinking of the Titanic, has died. A ticket for the maiden voyage of Titanic. People look at the 15 ton 13' by 30' portion of the First-Class C-Deck hull, one of the artifacts from the Titanic, at the Metreon on June 6, 2006 in San Francisco, California. A telegraph wheel from the Titanic is displayed in the Titanic: Artifact Exhibition at the Metreon on June 6, 2006 in San Francisco, California. Artifacts from the Titanic are displayed in the Titanic: Artifact Exhibition at the Metreon on June 6, 2006 in San Francisco, California. Giant starboard anchor of the Titanic is raised for the last time. 1.55pm 11th April 1912 in a picture taken by Father Browne. 1st class dining room on RMS Titanic taken by Father Browne. Marconi Room on RMS Titanic showing Harold Bride in a picture taken by Father Browne. White Star Wharf, Queenstown (Cobh) showing crowds waiting to embark on the tenders in a picture taken by Father Browne. Pipes and the captain's bathtub are shown in this July 2003 photo, of what remains of the captain's cabin on the Titanic more than two miles underwater in the north Atlantic. Recent research dives to the legendary shipwreck are showing the vessel is deteriorating faster than earlier thought. A few of the 15,000 workmen employed by Harland and Wolff Ltd. at Queen's Island, Belfast, with Titanic in the background. Long-lost film footage of the Titanic, showing the doomed ship moving slowly through Belfast Lough, has been discovered in the loft of a house in Glasgow. Frances Godden of Bonhams auction house inspects a silver table centrepiece from the a la carte restaurant on the White Star liner Titanic which sunk in 1912. A very rare lunch menu for the first full meal served aboard the Titanic, dated April 2, 1914. A letter written by first-class passenger Miss Alice Lennox-Conyngham to her nephew Alan Duff on the Titanic. The letter, postmarked only three days before the liner hit an iceberg and sank on its maiden voyage in 1912, had been used as a bookmark for years by its unsuspecting owner before a chance conversation revealed its value. Lord Pirrie, the former head of Harland & Wolff and instigator of the Olympic Class liners constructed on the Queen's Island almost 100 years ago. First Class menu from the RMS Titanic. Lunch menu from the RMS Titanic. Colin Cobb's Titanic Walking Tours. The pump house at Thompson graving dock. Colin Cobb's Titanic Walking Tours. The tour reaches the gates through which the Titanic workers travelled each day. By Staff Reporter A pocket watch recovered from a passenger who died on the Titanic has sold at auction for $57,500 (£44,765). A £14 million bid to buy a collection of more than 5,500 artefacts from the Titanic wreck site and bring them to Northern Ireland has been launched. By Staff Reporter The stories of those who survived the Titanic disaster after they were rescued from the water are set to be told in Belfast. A menu for the first meal ever served on the Titanic has sold for £100,000 at auction.